Turn video into insight. Find relevant images across multiple types of video files. Enroll facial images of ‘people of interest’ in a watch list and the system compares them with faces captured by body cameras. High-quality matches are ranked for analyst review. 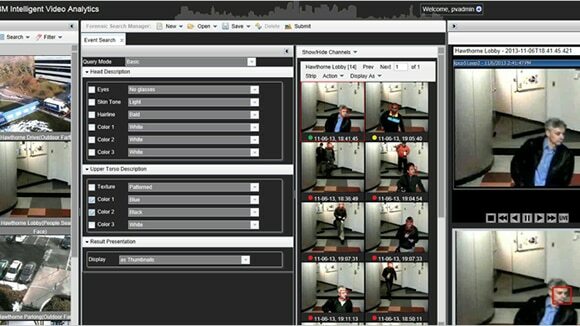 Configure characteristics such as age, gender, ethnicity, facial hair, hair color, clothing colors and patterns, to find matches within the selected files from multiple types of cameras. From live-streaming fixed cameras, receive automatic alerts when movement of objects is inconsistent with predefined patterns. Identify specific persons or objects plus the style of redaction and the system automatically redacts across one or multiple files. Manual control is available to redact specific content as needed. Abandoned object, track summary and heat maps, and redaction are advanced video analytics based on years of IBM vison computing research. IBM Intelligent Video Analytics cuts through the vast linear process of video monitoring by converting video images to data. Check out the operating system requirements for Intelligent Video Analytics before you buy. See a complete list of software requirements. Check out the hardware requirements for Intelligent Video Analytics before you buy. See a complete list of hardware requirements.